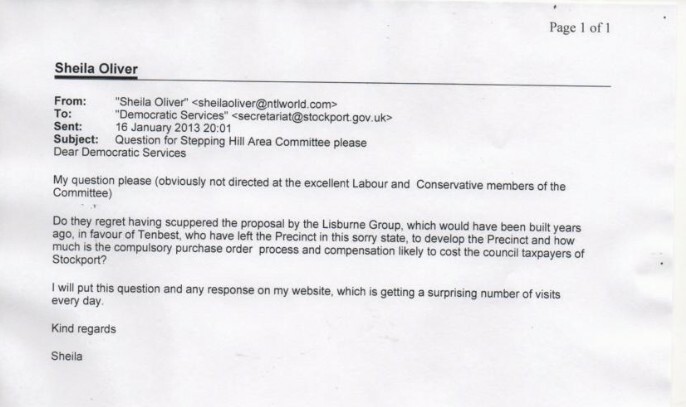 Do they regret having scuppered the proposal by the Lisburne Group, which would have been built years ago, in favour of Tenbest, who have left the Precinct in this sorry state, to develop the Precinct and how much is the compulsory purchase order process and compensation likely to cost the council taxpayers of Stockport? I will put this question and any response on my website, which is getting a surprising number of visits every day. Yeah, right! The Precinct is taking shape. What a joke this Council is. "Chatham Retail Limited was incorporated on 25 Apr 2005. The company's status is dissolved, with a team of 2 directors. They have no known group companies." "83/87 King Street South Shields (No. 1) Limited wason 12 Dec 2001. no known group companies. As of their last financial statement, they had £1 in cash reserves. , and the value of their shareholders' interest is £1." "Havenlea Estates Ltd was registered on 11 May 2005. The business has a status of 'Non-trading'. They were founded by Moishe Rottenberg, and Salomon Noe. There are 2 shareholders of Havenlea Estates Ltd. They have no known group companies." "93 St Johns Street Bury St Edmunds (No.1) Limited was on 12 Dec 2001. no known group companies. As of their last financial statement, they had £1 in cash reserves. , and the value of their shareholders' interest is £1." "Upperbrock Ltd was founded on 17 Feb 2005. The organisation's status is dissolved, and they have 4 associated directors - 2 are current, and 2 are former. The company has no known group companies." "185-187 High Street Hounslow (No.2) Limited wason 12 Dec 2001. no known group companies. As of their last financial statement, they had £1 in cash reserves. , and the value of their shareholders' interest is £1." "Enbrook Ltd was incorporated on 17 Feb 2005. The company's status is dissolved, with a team of 2 directors. They have no known group companies. Enbrook Ltd has not reported any financials as it is either too young, or exempt from filing accounts." "185-187 High Street Hounslow (No.1) Limited wason 12 Dec 2001. no known group companies. As of their last financial statement, they had £1 in cash reserves. , and the value of their shareholders' interest is £1." "Imberlay Ltd was registered on 17 Feb 2005. The business has a status of dissolved. Their founding director was Salomon Noe, who is British, aged 81. They have no known group companies." "18/19 High Street Dudley (No.2) Limited wason 12 Dec 2001. no known group companies. As of their last financial statement, they had £1 in cash reserves. , and the value of their shareholders' interest is £1." "18/19 High Street Dudley (No.1) Limited wason 12 Dec 2001. no known group companies. As of their last financial statement, they had £1 in cash reserves. , and the value of their shareholders' interest is £1." "Faxmoor Ltd was incorporated on 10 Feb 2005. The company's status is dissolved, with a team of 2 directors. They have no known group companies." "12/14 Chapel Street Chorley (No.2) Limited wason 12 Dec 2001. no known group companies. As of their last financial statement, they had £1 in cash reserves. , and the value of their shareholders' interest is £1." "12/14 Chapel Street Chorley (No.1) Limited wason 12 Dec 2001. no known group companies. As of their last financial statement, they had £1 in cash reserves. , and the value of their shareholders' interest is £1." "Citybrook Properties Ltd was incorporated on 20 May 2003. The company's status is active, with a team of 3 directors. Citybrook Properties Ltd is split between 3 shareholders. They have no known group companies. Citybrook Properties Ltd have total assets of £215,848 plus total liabilities of £2,458,173. They owe £399,294 to creditors and are due £145,381 from trade debtors. As of their last financial statement, they had £70,467 in cash reserves. Their net worth is £273,951, and the value of their shareholders' interest is £273,951. " "62 High Street Gosport (No.2) Limited wason 12 Dec 2001. no known group companies. As of their last financial statement, they had £1 in cash reserves. , and the value of their shareholders' interest is £1." "Agra (Freeman Development,Grimsby) Ltd was incorporated on 08 May 2003. The company's status is 'Non-trading', with a team of 3 directors. Agra (Freeman Development,Grimsby) Ltd is split between 2 shareholders. They have no known group companies." "16 Cornhill Bridgwater (No.1) Limited wason 12 Dec 2001. no known group companies. As of their last financial statement, they had £1 in cash reserves. , and the value of their shareholders' interest is £1." Fortunately, the Cabbies showed they wouldn't be pushed around. "Lencliff Ltd was registered on 20 Mar 2003. The business has a status of dissolved. They were founded by Zev Shainfeld, Baruch Springer, and Salomon Noe. They have no known group companies." "165/167a High Street Orpington (No.1) Limited wason 12 Dec 2001. no known group companies. As of their last financial statement, they had £1 in cash reserves. , and the value of their shareholders' interest is £1." "Heelbar Ltd was registered on 02 Jan 2003. The business has a status of dissolved. Their founding director was Salomon Noe, who is British, aged 81. They have no known group companies." "126/132 High Street (Elgin) (No.1) Limited wason 12 Dec 2001 in Glasgow. . no known group companies." "71/73 High Street (Dumbarton) (No.2) Limited wason 12 Dec 2001 in Glasgow. . no known group companies." "15 High Street Mold (No.2) Limited wason 12 Dec 2001. no known group companies. As of their last financial statement, they had £1 in cash reserves. , and the value of their shareholders' interest is £1." "42 Saturday Market Beverley (No.1) Limited wason 12 Dec 2001. no known group companies. As of their last financial statement, they had £1 in cash reserves. , and the value of their shareholders' interest is £1." "8/12 Bridge Street Haverfordwest (No.2) Limited wason 12 Dec 2001. no known group companies. As of their last financial statement, they had £1 in cash reserves. , and the value of their shareholders' interest is £1." On October 25th 2012 a memorandum of satisfaction was lodged. Tenbest currently has a book value of £1,027,492. On 22nd March 2011 the Council served notice on the owners of the Precinct under Section 59 of the EPA. A written interview under caution was sent to the owners on 14th November 2011. (how a written interview can be sent is beyond my comprehension, but that is what SMBC claims). The Council's Planning Enforcement team also wrote to the owners - under the provisions of s215 of the Town and Country Planning Act - with a list of improvements they needed to take action on. Alongside these measures the authority has alsp been pro-actively been pursuing a long term resolution to the site through redevelopment. This has involved negations with both the owners of the precinct and other interested parties. Who "preferred" Tenbest as developer? Was it Mr Steve Burns? Why is it so preferred? Opted to file accouns on a "cloudy" basis i.e., no trading account. Why are there so many companies of which Tenbest is one? Fishy? The options are becoming more limited. Tenbest have been calling the shots - putting more and more conditions and SMBC are more and more in a bind! The risks are higher if there is such a rush after such a long delay. The first two are uncertain in outcome and the other one - No 3 - Do Nothing! It is the safest bet for SMBC. Mr Ausman Ramzan and Brookwide Ltd on Monday 19th and Wednesday 21st July 2010. The Council is party to the redevelopment of Offerton Precinct and should beware of any dealings with the family owners. In order to illustrate the code which Agra and its group follow, a case involving property and an AGRA subsidiary (100%) Brookwide Ltd has been examined. The full picture is set out in the judgement handed down by Miss Geraldine Andrews QC in October 2010, The Defendent Brookwise - Claimant Ausman Ramzan. The AGRA Group mainly consists of subsidiaries with complex financing arrangements - bank loans, mortgages, guarantees and inter company debt. Throughout the ten years of legal wrangling it is clear tha delays were caused by deliberate errors and explanations - ownership of property, local of companies and their relationship. A property was leased by the claimant from mid 1989 to 03/92 when he purchased the freehold as a restaurant. In 04/99 the employees of the defendant worked on the property knocking down and then bricking up an adjoining wall, cutt off the fire escape, destroying the fire alarm. The restaurant could not function. There was a reckless disregard for anyone's interests but their own - only Brookwide's. There was confusion regarding ownership - transfer or consideration to AGRA. The various damages awared were substantial and the claimants would certainly not have entered into this kind of action lightly. The damages cost the defendant a year's profits - £360,000 - and this doesn't include costs. So if the Council takes these people on over Offerton Precinct they need to have the backing to take on AGRA and the rest of its group. Many years were spent by Stockport Council in promoting redevelopment. On 25/02/09 an agreement with Tenbest Ltd was made - Tenbest is the major landowner. Tenbest has an association with circa 100 companies - why? Since then no progress was made (and what on earth was the highly paid Council panjandrum Steve Burns doing all this time?). They were all waiting for a suitable end user. I saw Mr Steve Burns inform a planning inquiry inspector that he had seen evidence that there was an end user for this site. That end user failed to materialise. Tenbest say they have now found an end user but now Tenbest Ltd needs changes to the 25/2/09 agreement. Opportunity for securing the regeneration within 18 months. The Council supports the recommendation. The Executive approve the changes. If Tenbest are unable to comply with the reviewd terms bu 30/11/12 the Council must proceed to declare a General Vesting Agreement. If the GVD is served without any funding from Tebest costs in the meantime will be met by our old friend to Stockport Council "Prudential Borrowing" by SMBC - which will be financed out of future capital receipts from the disposal of the site. In 2009 SMBC had decided (a) to proceed with Tenbest and (b) pursue a compulsory purchase order. This CPO went ahead in 2009. However, Tenbest had been unable to produce an occupier at a price which would allow the job to proceed. In June 2012 Tebest confirmed that an agreement had been made with a supermarket. But a number of variations had to be made between Tenbest and SMBC. These included fixing a maximum cost that Tenbest would pay towards CPO aquisition. RISK TO COUNCIL. Tenbest has now got independent valuations advice which supports their limit. Tenbest's ownership is only partial. More permissions! Note - the CPO process started in Marcy 2010 - it has therefore to be exercised by March 2012 or its powers are lost. This made the General Vesting Declaration a likely way ahead and must be done by 12/12/2012 on the basis that SMBC wish to press on ASAP, A CPO valuer is necessary and (Hannah knows the background). It is beneficial to relax the contract procedure rules in order to allow the appointment to get going. Tenbest must delivery satisfactory agreements in time to allow the Council to authorise the service of the General Vesting Declaration by 12/12/2012. If Tenbest fail, then SMBC must carry on alone or lose the CPO powers. 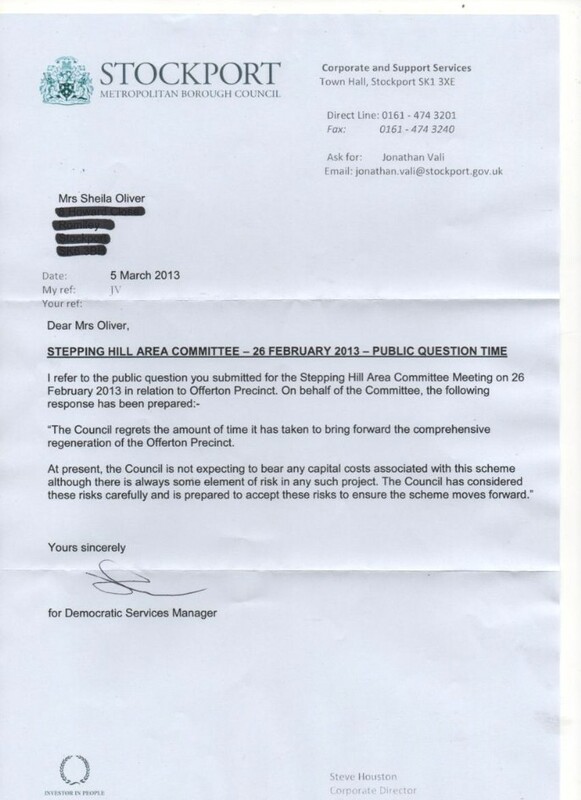 3) Allow the CPO to lapse and take no further action re the site. YES, WAKE UP TO TENBEST AND SMELL THE COFFEE. LET THE SITE DETERIORATE FURTHER IN THE HANDS OF TENBEST. The Executive is recommended to approve Tenbest's request and they did. If Tenbest can't follow through, declear GVD by 12/12/2012 agree that, meanwhile costs are met by Prudential Borrowing. Authorise Hannah. NO. There is a move afoot to regularise the situation where companies are run by the same directors and have the same individual shareholders, yet are not regarded as "Group" thereby keeping them out of the common liability/responsibility if any one goes wrong. Usually family - like the Tenbest group of companies. It turns out today from the CPO documents that there is a covenant on the Precinct - not to erect detached or semi detached private dwellings or any block of flats or any other building solely for the use of residential purposes on the land known as The Precinct, Almlwch Avenue. So, they knew they couldn't allow the small scheme just for the garage site to be passed (and they didn't pass it after making them spend thousands of pounds and waste years on this), they knew that the Precinct land was virtually worthless as the planning permission couldn't be implemented and they knew unless they put something like a big Tesco there the land would remain vacant for years, as what else could go on there. Couldn't the lying weasels have just been honest for once and explained the situation. 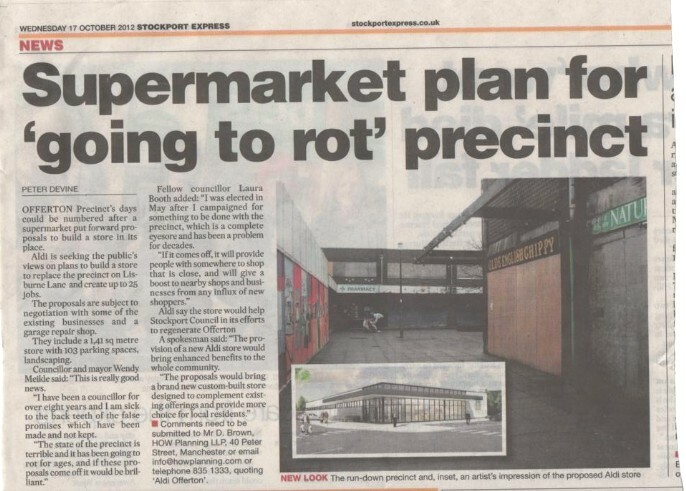 What I think has gone on is further evidence of the corrupt planning situation in Stockport.
" The owners of the Precinct have long had a planning permission to build housing on the site"
" a covenant on the Precinct - not to erect detached or semi detached private dwellings or any block of flats or any other building solely for the use of residential purposes on the land known as The Precinct, Almlwch Avenue." The idiots at the planning office/planning committee gave them permission when they shouldn't have done. They have misled the owners of the garage, caused them to spend thousands on futile surveys and consultants reports over years when they knew all along they couldn't let them have the planning permission? They expected them to give up but they are decent people and this was about more than the money or loss of business. That is shown in how they went to the local community trying to ascertain what they would like to see on the site. They didn't have to do that. Then the planning committee stage is bent too, which I have long suspected. Plus, I read that planning application in the past - there were over 400 objections, which is a huge number. When I went for the £388 map a chap there who dealt with Stockport from a developers point of view said if they didn't want you to build something they demanded more and more expensive reports and then moved the goalposts till you gave up or your money ran out. I asked the Council a FOI question about the Precinct recently. My question had been - did the Council have any plans for the purchase of the Offerton site - to which the reply was a clear negative. It, therefore, came as a surprise to me that at the very time of their writing that the council was already serviced a General Vesting Declaration - signed 14th January 2012. This declaration leads to the aquisition by the Council of all interests in the site (including those of Tenbest, the developer and at the Council's risk the development of the site. If this is not a purchase, then I don't know what is. The Council must surely have been aware of these procedings - perhaps the were reticent in being forthcoming because the council appears to have been outmanoeuvred by Tenbest, to whom compensation must now be pad after their long delaying actions. Did the person who answered my request not ever talk to Barry Khan, the Council Solicitor who was at the same time arranging the General Vesting Declaration for the site? Is the council's reply not misleading and where does this leave FOI at Stockport, already badly holed below the waterline over the toxic waste dump school fraud? These panjandrums should stop throwing the word "vexatious" around and stick to the issues. For the record my firm view has always been the best route to take was to let the compulsory purchase order lapse and stay out of it for the time being and not get involved in costly, meaningless disputes, which I believe would leave the Council out of pocket and achieving nothing.